HandyHome is a home electronics repair service provider. Mumbai-based startup HandyHome which allows users book brand’s authorized repairs and other services like maintenance, demo or installation for electronics alliances in or out of warranty. Founded in January 2015 by 6 IIT Bombay graduates (Akash Goel, Manthan Shah, Aditya Gupta, Kartikeya Datt, Bonish Gandhi and Harmin Shah). Q1. Hi Harmin, it’s really a pleasure for me to conduct this interview with you. Thank you for taking out the time. We are very curious to know more about you? Ans. 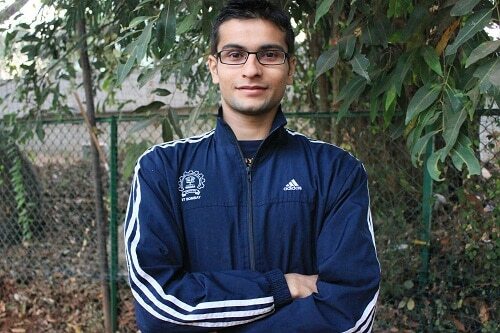 I am a recent IIT Bombay graduate and I have co-founded HandyHome with 5 other batchmates. I was born and brought up in the city of Ahmedabad, after which I moved to Mumbai. I have a passion for problem solving right since I was a kid, and that is what has pushed me to start a new venture. HandyHome will change the way millions of people go about their households services. We have stared repairs and services for electronic appliances, and will soon venture into other aspects of household services. Q2. Handyhome is a platform covering all the repairing needs. The idea of finding the right person for home/kitchen appliance repairs is quite interesting. Tell us , How did you come across this wonderful idea? Ans. This idea was born out of a personal experience, when an AC in my rented flat broke down. It was 3 serviceman visits after which my AC was finally in a running condition. The first 2 times, I called a local person who didn’t have enough skillsets to fix the appliance. The 3rd time, I called the brand’s own technician, and he did a pretty good job. The only problem I faced with the brand’s technicians was that the whole process was confusing and lacked clarity and transparency.This is when I, along with my flatmates, decided to do something about it. Today, one can order food in 1 minute, buy an AC online in seconds, but it still takes a lot of time and efforts in booking an authorized serviceman. This is something that had to change. Q3 .What do you think was the biggest challenge in operating this business? How did you met the challenge? Ans.The biggest challenge faced by anyone in the service industry is providing service with the promised standards. We have overcome this challenge by investing and developing sophisticated technology for appropriate automation and streamlining. Also, we have onboarded the best industry people for this purpose. Q4.Mr. Shah, Handyhome is unique business model. How does digital Marketing contribute in your business strategy? Ans. Digital marketing is the only source through which our users get in touch with our product (website/app). More than 90% of the website traffic and app installs comes through digital marketing platforms. We use social media extensively to educate users about this unique offering that we have. We are also into search & display advertising to get users with relevant intent to visit our site and generate queries. Engagement with our existing users happens through emails, messages and push notifications on the App. All of these platforms come with very informative dashboards so that you can study and track each and every action taken by us. Q5.Where do you see the future of digital marketing in the industry? Ans.In India, people are getting more and more involved in their day-to-day busy life, and are switching to digital media for all their needs – be it work (emails, cloud based ERPs, planning tools, open source softwares, etc), leisure (Social media), household and personal needs (shopping, food ordering), education (tera bytes of information on the web through learning sites, blogs, etc). In such a scenario, the only way for businesses to reach out to their users and engage with them will be through digital marketing. Q6. Indian Business has gone through a complete turnaround and using digital marketing for its advancement. What`s your view on it? How has this turnaround changed your business? Ans. HandyHome, as a company, is investing only in Digital Marketing for the coming few months. Digital marketing is a great gift to businesses, especially to startups, as it proves to be verty cost efficient. For HandyHome, Digital media has helped a lot in terms of reaching out to a lot of people at very minimal cost. At the same time, startups need to study a lot of user behavior in its initial growth period. The best part about digital marketing is that it is measureable and with complete data points, and it has helped us study user behavior appropriately, which in turn has helped us achieve a great product market fit. Q7. What services are you providing currently and can we see your company expanding the services in the coming time? Ans. HandyHome has a vision to solve all problems faced by households for their service needs. Starting with the field of electronics services, we plan to get into a few other services in just a couple of months. Our current focus right now stands at growing in this vertical and solve this problem for households. Q8. We heard you have raised fund this month. Let us know more about company’s funding? Ans. We are backed by 2 major VC firms – Silicon Valley based Besssemmer Venture Partners and Mumbai based Kae Capital (run by Sasha Mirchandani). They believe a lot in the idea and the team, and have fueled in a total of $500K in a seed round investment. Q9. Let me close this interview by asking, If someone asks for your advice and you only had a few minutes to give your best tip, what it would be to start up an e-commerce business? Ans. A lot of companies come up with very niche offerings and build extensively before going out to the market and reaching out to users. More often than not, startups realize that a lot of developments made have not been adopted by the market, resulting in a lot of rework. “Thank you so much Harmin for your time.” Best wishes for you and your Company from team DSIM.